As a General Rule: If your car moved in the accident, your spine probably moved as well! Recovery Process May Get Delayed-Seeking a chiropractic exam is imperative following an accident. A chiropractor is trained to identify any misalignments or shifting of the spine following trauma. Failing to seek immediate medical care after an auto accident can be costly, delay the recovery process, or worse cause future irreparable damage to the spine. Hidden Injuries-Some of these injuries can be hidden or delayed and not even develop for weeks to months after the accident. Timing is Crucial-When auto insurance companies are involved; timing becomes crucial in receiving coverage for your auto accident injury. Hidden Injuries- Some injuries such as whiplash do not present immediately following an auto accident. It sometimes takes days or weeks to feel the symptoms of whiplash (headache, soreness, dizziness, pain in the upper back and neck). We can properly diagnose your injuries and initiate your Chiropractic care plan before the pain worsens and becomes unbearable ONLY if you seek care immediately after your auto accident. Surgery-Free and Drug-Free Approach to Pain Relief- Pain medication and other narcotics commonly prescribed following auto accidents can be extremely addictive. Chiropractic care offers relief from pain without the need for any addictive drugs or medications and promotes natural healing, not just masking the pain. Reduces Inflammation- Chiropractic adjustments area safe, gentle, and effective way to relieve pressure on the nervous system which reduces inflammation and alleviates pain. Restores Range of Motion- Chiropractic adjustments can help mobilize your spine, stop scar tissue from forming, and restore range of motion. At North Broward Chiropractic our doctors have decades of experience and training to provide you with the highest level of rehabilitative care to help you avoid long-term pain and promote natural healing. From the moment you call to set up your 1st appointment, our staff will be there to explain everything and assist you every step of the way. You can expect your 1st visit to take between 30 minutes to 1 hour. You will meet with one of our highly skilled and trained doctors who will ask you a specific line of questions to get a complete clinical picture of your injuries. Next, the doctor will perform an examination and may take x-rays at our facility. Answers to these questions and findings from the examination and x-rays will help us correctly identify the extent of your injuries and determine the exact course of treatment. Immediately, the office will schedule a second visit to go over your examination and imaging results with the doctor and to discuss your diagnosis and treatment plan. Your health is our priority and we will work together with you to determine the best plan of treatment to help to get you on the road to relief and recovery. Please make sure to bring your photo ID, auto insurance card and claim # to your appointment. -Can your chiropractor work with my insurance company and/or legal case? Yes! North Broward Chiropractic has decades of experience in managing auto accident cases, co-managing cases with other specialists, and attorney firms. 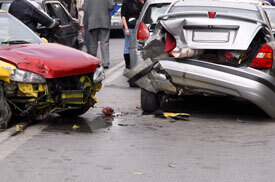 -How soon after an auto accident should I get checked out? You must obtain medical care within 14 days if you suffer injuries in a traffic accident in Florida, or else your insurance company will deny your claim. Failing to receive medical attention and services within 14 days after the auto accident gives your insurance company the right to deny medical benefits. It’s always important to seek immediate medical care after an auto accident – not just for insurance purposes. Failing to see a doctor right away can worsen your prognosis for recovery. Many injuries can have delayed symptoms, including back or neck injuries. If you feel a tightening in your neck and shoulders after an auto accident or another incident that snaps your head forward or backward, you may wonder about whiplash. How do you know if you have it? You may feel signs and symptoms of whiplash immediately after the injury or they may not show up for several days to WEEKS. Common signs of whiplash include pain, muscle spasms, decreased range of motion, headache, stiff neck, fatigue, anxiety, and memory disturbances. -I don’t feel injured why should I still visit a chiropractor? Just because you don’t feel immediate pain, it doesn’t mean that everything is working perfectly. Pain often manifests itself much later, after the injury has had time to settle in and progress. Instead of waiting for this to happen, get to the chiropractor and let them assess you immediately. They may be able to do a quick check of the spine, looking for joint restriction that could lead to significant pain and arthritis later. And if these areas are found, they can nip them in the bud before they have the chance to cause you discomfort.